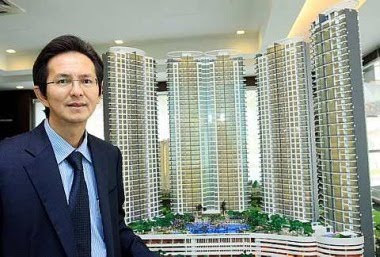 Datuk Tong Kien Onn with the model of Tropicana Grande condominiums. PETALING JAYA: Dijaya Corp Bhd plans to build more lifestyle commercial and residential property projects in the Klang Valley and other growth areas to cater to a growing demand for such facilities. According to managing director Datuk Tong Kien Onn, the company has at least three commercial projects in the pipeline, including Tropicana Avenue and Tropicana Office Towers in Tropicana Golf & Country Resort, and Tropicana Gardens in Tropicana Indah Resort. Tropicana Avenue, with two floors of retail podium and office space, will have net lettable space of 561,000 sq ft. The office space is for sale and the retail podium will be for lease. The RM205mil project will be launched by mid-2010. Also coming up next year will be a RM250mil twin office towers project with 400,000 sq ft of net lettable space including space for holding events. One block will be for en bloc sale and the other will be for rental. The third project, Tropicana Gardens on 6.8ha next to Kota Damansara, will have service apartments and lifestyle retail space. It is slated for launch in 2011. Tong said Dijaya would also be looking to replicate the integrated lifestyle Tropicana City project in other growth markets. “These self-contained projects with retail complex, offices and residences, promote the concept of work, live and shop for the new breed of young and trendy population,” he told StarBiz. Tropicana City comprises Tropicana Mall with 450,000 sq ft of net lettable area, a 12-storey office block with 105,000 sq ft office space and a block of service suites. Tropicana Mall, Dijaya’s first retail property, opened for business last December. The retail space is fetching rental rates of RM10 to RM20 per sq ft. The office block will be completed in October while the 601 units of Tropics service suites will be ready by next June. Tong said revenue contribution from its commercial projects was expected to rise to 55%-60% in the coming years from about 45% now. On the residential front, he said Dijaya would be targeting its new launches at foreign buyers, especially Singaporeans. One of its upmarket high-rise projects is Tropicana Grande, to be built on the last parcel of land in Tropicana Golf & Country Resort. Located on 2.08ha, there will be four blocks with a total 300 units priced from RM600 per sq ft. Tropicana Grande will have a gross development value of RM540mil. At Tropicana Indah Resort, 12 Grand Villa bungalows of 8,000 to 9,000 sq ft priced at RM4.5mil to RM5.8mil will be launched by year-end. There will also be 54 Pool Villa semi-detached homes of 5,812 to 7,945 sq ft priced from RM2.8mil each. Also planned for launch next year will be Tropicana Bayou on 26.4ha in Balakong and a 8-ha residential development in Sungai Long. According to Tong, innovation, superior quality and practicality would be the hallmark of all the company’s projects going forward. “We will be leveraging on our success in building the 250-ha Tropicana Golf & Country Resort and 163.6-ha Tropicana Indah Resort and have more innovative and quality products for the market,” he added. Describing the property market as going through a “cooling-down period” after “a confidence plunge” around the third quarter last year, Tong said the market was holding out well despite the severe meltdown in many parts of the world. “We do see some positive signs in our sales and we are optimistic that the market will turn for the better towards the year-end and early next year. The market should start to recover by year-end when confidence starts to pick up again,” he added. Over the past seven months, Dijaya achieved RM215mil in sales, or about 70% of its sales target of RM260mil for the financial year ending Dec 31 (FY09). For FY08, it recorded a sales revenue of RM244mil. GUOCOLAND (Malaysia) Bhd is targeting to launch an integrated high-end development in Damansara Heights, Kuala Lumpur, by the end of this year. As the property arm of the Hong Leong Group, the project known as Damansara City will be worth about RM2 billion. The 3.4ha project will comprise two landmark office towers, two blocks of luxury condominiums, a five-star boutique hotel that will be managed by the UK-based Thistle Group, and a 300,000 sq ft retail mall with four levels, the first in Damansara Heights. Damansara City was due for launch in June 2008 but was held back as GuocoLand had wanted to fine-tune the design and layout for each of the components. "We hope the building plans would be approved soon so we could launch the project by December and commence work on the basement and super structures. The foundation is ready," GuocoLand executive director Chan Chee Meng said. Chan said that GuocoLand will launch the office towers first, and sell them en-bloc. He added that GuocoLand has been approached by Malaysian as well as overseas buyers. "The market for high-end condominiums at the KLCC area has been soft since last year but we reckon that office buildings in prime locations will be much sought after, especially in Damansara. Therefore, we will launch the office space first. "We were approached by interested parties for the office blocks because of the prominence of the project. Talks are on-going but we are not committed yet," Chan said. On whether the condominiums will go en-bloc, Chan said GuocoLand will look at selling the units individually, or in bulks. "This is one of the last prime pieces of land left in Damansara Heights so there will be demand for luxury condominiums. We will look at the market situation before launching," Chan said. On the hotel, Chan said it will be called Gouman. Thistle Group owns two brands namely Gouman, which is the name for five-star hotels, and Thistle for four-star properties. PETALING JAYA: Malaysia Institute of Estate Agents (MIEA) president Julie Wong may be new in her post but she has kept busy from day one of her appointment on Apr 25, scheduling courses and conventions to help raise the standard of real estate agents in the country. Wong said she wanted smaller versions of MIEA’s annual Malaysian Annual Real Estate Convention (MAREC) to attract a wider audience and help bring in additional revenue for the institute. “We will be organising this spin-off convention from Oct 31 to Nov 1 in Johor. When we organise MAREC, the participants are mostly from the Klang Valley. “By having an event like this further south, we can attract participants from the south of Malaysia and even Singapore,” she told StarBiz. The Johor convention, themed Iskandar – Rise of the Metropolis, would focus on the prospects of Iskandar Malaysia and was targeted to attract up to 300 participants, she said. Wong also plans to organise a one-day convention in Penang in March and mini courses for negotiators later this month and early September. She held her first negotiators’ course in May. She also hopes to organise bi-monthly luncheons in cafes or restaurants that would be open to members of the institute and even the public. Wong also wants to assist developers that are having problems “clearing their inventories”. Wong said the event could be held in a multi-purpose hall or an outdoor tent. “It’s still in the planning stage but we hope to have our first property mart by December,” she said. To enhance the image of real estate agents, Wong said the MIEA also intended to collaborate with Malaysia Property Inc (MPI) to help educate and train potential realtors. “We hope to collaborate with the MPI and market courses such as CIPS (Certified International Property Specialist) and CRS (Certified Residential Specialist),” she said. The MPI, a joint public-private sector initiative, was recently set up to attract foreign investments to the real estate sector over the next 10 years. “This is a good profession to make money. If one is focused and determined, one can be successful in this line,” said Wong, who has over two decades of experience in selling residential, commercial and industrial properties and leasing of land. She said estate agents should “think outside the box” to be resilient, especially with the current global economic downturn. Under Wong, the MIEA also organised its inaugural National Real Estate Awards in June. She said it was a great achievement for the institute and that the awards would make a great benchmark for successful realtors. Wong also said a rebound could already be seen in the local property sector. “People are already starting to buy properties. This is especially for units worth RM600,000 and above. “High-end developers, especially, should not be afraid of selling now,” she said.